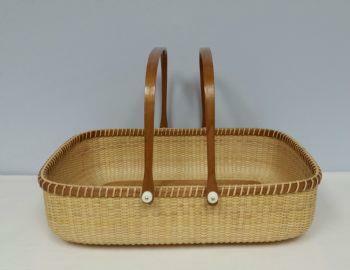 The Nantucket Gathering Basket is a large, oblong-shaped basket with an open top. It is constructed using only the finest cherry wood, including the base, rim and handles. The Gathering Basket measures 15 inches long, 10 inches wide, and stands 5 inches high. It is adorned with 2 handles attached with bone knobs. The large cherry base is finished with an ivory plug. This beautiful gathering basket is signed and dated on the bottom. Because they are hand-made to order, all baskets take around 8 weeks for delivery. BUT We offer a beautiful gift card with a photo of the basket you have ordered - the inside is blank for a personal message to the recipient stating that the basket is being specially hand woven for them!